Enjoy fresh flowers outside – let them stay in the garden! 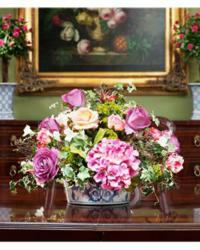 – and for easy interior decor, consider the lasting beauty of silk florals. Relax this summer and enjoy easy, hassle-free décor with Silkflowers.com’s Summer 2012 collection. Silkflowers.com’s Summer 2012 collection offers single stems of popular summer blooms (hydrangea, peony) starting at $3.75 and arrangements and centerpieces ranging from $29 to $479. Highlights include: The simple yet elegant Hydrangea Centerpiece ($69) and Gerbera Daisy Centerpiece ($79), both in stylish clear glass vases; the cheerful Calla Lily, Tulip and Lily Centerpiece ($159); the classic Zinnia, Snapdragon & Lilac Centerpiece ($199); and the eye-catching Peony Deluxe Centerpiece ($229). Other summer favorites such as sunflowers, roses, black-eyed Susans, azalea, delphinium and pansies are offered as well. Gifts purchased from Silkflowers.com are shipped directly to the recipient’s doorstep. And like all Silkflowers.com products, they’re expertly packaged to arrive in perfect shape for instant display right out of the box (unlike fresh cut flowers that are often dead by the time they arrive). Silkflowers.com gifts are adorned with a stylish gift card, too, that may be personalized with a message of choice. To view the entire Silkflowers.com Summer 2012 collection, please visit http://www.silkflowers.com/seasonal-collections/summer . High resolution photography is available at http://www.silkflowers.com/pressroom and upon request. Silkflowers.com is also on Facebook and Twitter and has a blog, http://blog.silkflowers.com. Silkflowers.com is the nation’s largest supplier of designer-quality silk botanicals, including floral arrangements, decorative stems, plants and trees. The company proudly offers the widest selection and inventory of beautifully designed silk creations at affordable prices, delivered directly to consumers with utmost care. Silkflowers.com’s sister company, OfficeScapesDirect (http://www.officescapesdirect.com), serves the commercial market in the same manner, offering the widest selection anywhere of designer-quality silk botanicals for business interiors and commercial spaces. Both companies are located in Cincinnati, Ohio, and White Plains, N.Y.